The University of New Brunswick’s faculty of engineering hosted its fifth annual Engineering Design Symposium on Thursday, April 4, 2019 at the Fredericton Convention Centre from 8:30 a.m. to 5 p.m.
During their fourth year of studies, engineering students group together to develop projects through the capstone design course, and with the guidance of industry mentors and professors, they deliver clients with fully realized ideas and solutions. The Engineering Design Symposium gives students the opportunity to showcase their innovative projects to the greater community. Local governments, companies, and non-profit organizations sponsor a large number of the design projects. With the guidance of industry mentors and professors, fourth year engineering students group together to develop projects through the capstone design course to deliver clients with fully realized ideas and solutions. The symposium is a great example of how UNB helps students prepare for the future by encouraging them to explore what happens outside of the lecture hall. They use critical thinking, innovation and resourcefulness to develop their designs. “The Engineering Design Symposium is a highlight for the faculty of engineering every year,” says Dr. Chris Diduch, UNB’s dean of engineering. “Students are given the opportunity to showcase the engineering design projects they’ve worked hard on all year, many of which, once implemented, positively impact the community." See the winners from each department. 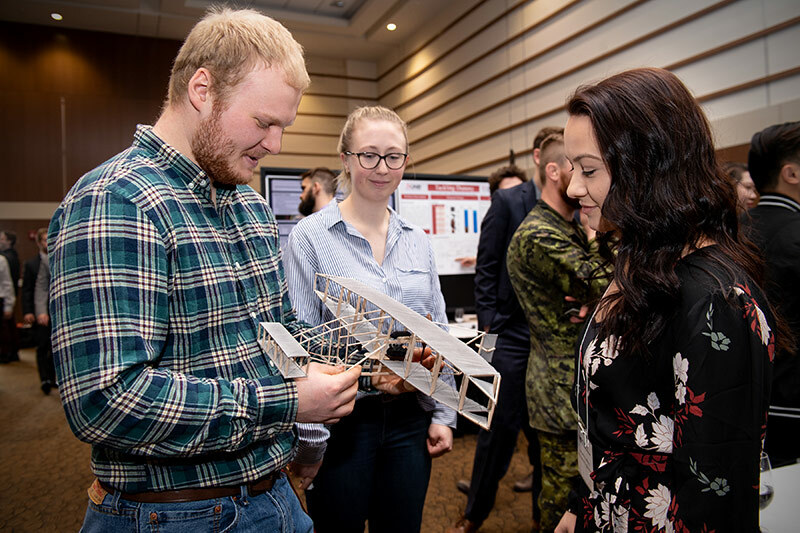 Photo: Fourth year engineering students show off their project at the Engineering Design Symposium, April 4, 2019. Credit: Rob Blanchard/Photo UNB.